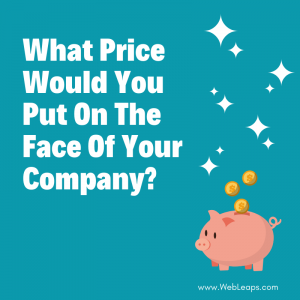 What price would you put on the face of your company? Imagine that you have to hire an employee who will be the first person your customer meets. How would they look? What would they say? Are you confident that they have all of the information necessary to sell your product or services to your customer? If your customer asks them a question, do they have the answer? Is it the right one? Your website IS that employee! If you’re not confident that your website is showcasing your products & services in the best light and that it has relevant and updated material, give us a call. Your website is a priceless employee that your customers turn to 24/7/365. What does your website say about you?